This is where many displaced people who were already living on the edge – of canyons, of finances, of California’s blue political culture –lodged when the Camp Fire swept through their communities, and here as elsewhere, disaster response has been underway. 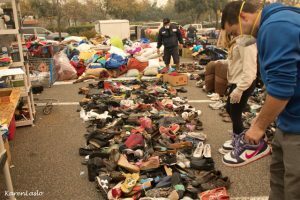 Chicoans pull in with boxed donations and trailers hauled from other cities deposit piles of used clothing and worn shoes. 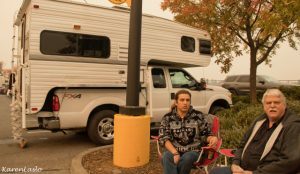 The grass-roots, open-air, people-run shelter seemed to spring almost spontaneously from the Walmart pavement in the days that followed the wildfire now considered California’s deadliest. 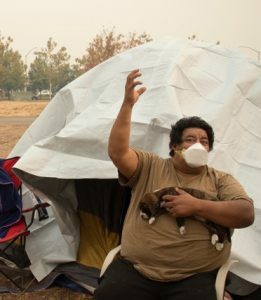 Shelters are sprinkled throughout North State communities for people who can’t afford hotels or don’t have a network that reaches into suburban Chico where many residents have opened spare bedrooms to evacuees. 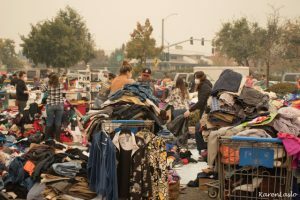 But perhaps nowhere do you see more chaos, more random generosity, more of the independent spirit that often characterizes the foothill communities than in the Walmart parking lot. Donated toilet paper rolls, packages of wipes, Bingo and Cranium board games, and toothbrushes have been loaded into and are brimming out of shopping carts. How to manage the shelters, treat those who have medical needs and prevent the spread of disease is now the most pressing matter for city and county officials and citizen volunteers. But beyond that problem is the next: how to absorb thousands of people, many of whom are now in desperate straits. What happens, they say, to the shelter resident who needs transportation to dialysis and has only $2? What’s happening to the 80-year-old disabled Paradise woman who lost her home and was moved into a hotel room, the cost of which was covered for only six nights? More than 8,600 homes were destroyed in the foothill towns of Paradise, Magalia, Concow and elsewhere, leaving some 52,000 people displaced from destroyed and damaged homes, officials say. According to the U.S. Census, almost 20 percent of the county’s residents were already living in poverty in 2016. Almaguer said there was a confirmed outbreak of Norovirus, a stomach bug, at the Neighborhood Church shelter, and stomach upsets have been reported at others. “It’s not uncommon to see when you have hundreds of people living in close quarters,” Almaguer added. 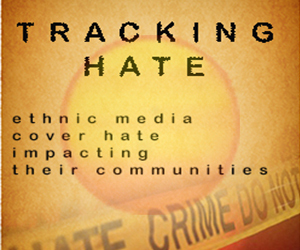 Each day brings grim news as more human remains are discovered and the death toll rises. On Wednesday it was 56, but with 130 still missing. As we talk, a car pulls up and a young woman hands Harley and housemate Angel Gutierrez new packages of Chapstick. Volunteers are struggling to organize mountains of donated goods and convey to donors that they can’t possibly use any more tank tops. 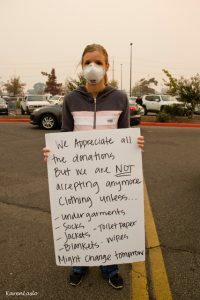 A girl at the entrance to Walmart holds up a sign saying no more clothing is needed with the exception of undergarments, jackets and socks. Amongst motor home owners, Walmart is well known for what Harley calls its “wide array” of products, but also because it allows free overnight camping to RVs. Batres, a house painter, found a place to camp at the edge of the parking lot, and someone managed to get him tarps that he used to erect a small tent for his wife, two children and Max, the puppy. “Last night was really freezing,” he says. Luis Batres describes the flames he saw as he escaped Magalia. 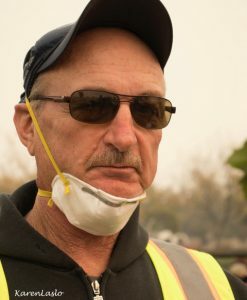 Another tent camper is a teen girl who lived part time with her grandfather in Paradise – until his house was destroyed by the Camp Fire. Now she lives with her long-term homeless boyfriend. 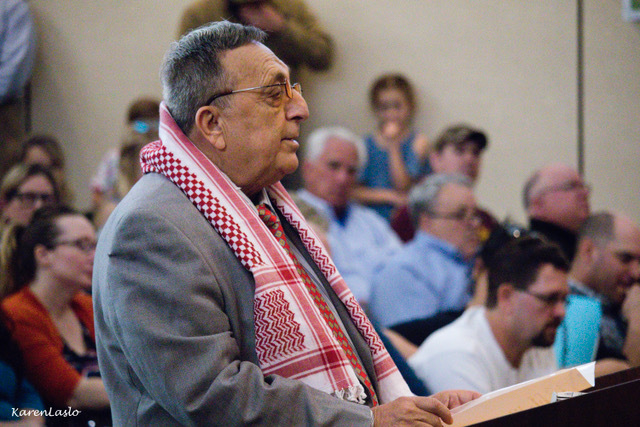 Guido Barbero was one of the Chico multitude who, in the face of catastrophe, had to do something helpful. He came to the Walmart parking lot with some clothes to donate and in search of a role to play. Today he’s wearing a reflective vest and directing volunteers in the “triage” section. Barbero said the volunteers had raised $10,000 with a GoFundMe campaign and were giving $25 gift cards to the families who needed them most. “We’re overwhelmed by donations,” Barbero said of the used clothes piling up. “A trailer came from Las Vegas packed with new and used things. We’ve had trucks come full of donations, people come from Tahoe, Auburn, Sacramento. This has a life of its own. A Chico police officer comes by to give instructions on where to dump RV sewage and tell the Magalia residents that they’ve been invited to shower at the Chico Sports Club. It is one day after Gov. Jerry Brown called the Camp Fire the “new abormal,” blaming human-caused climate change for California’s increasingly ferocious wildfires. Do the Magalians share that view? Almost in chorus, five people – Harley and his neighbors — say no, that it takes a “Governor Moonbeam” to come up with stuff like this. The Camp Fire was so hot it melted water tanks, vehicles and the wheels of cars, often leaving only a stream or puddle of silver. Most of the people interviewed by ChicoSol at the Walmart camp blamed PG&E for the fire, pointing to reports that the utility company was undergoing equipment problems. PG&E may indeed have caused the fire, Stemen said. The North Valley Community Foundation says its Camp Fire Relief Fund has received $3 million for victim assistance and rebuilding. CEO Alexa Benson-Valavanis said it’s already given a dozen shelters $10,000 each. 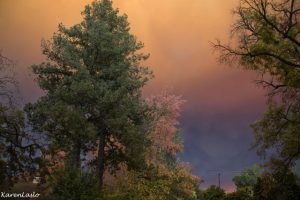 Mary Kay Benson, manager of Chico 350, an organization focused on climate change action, calls the fire evacuees “climate refugees” because they’ve been displaced by a climate-change driven event. 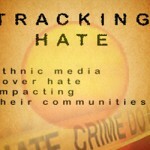 But whether they call themselves that may not be so important, she suggests.